A single pallet bag in 4 or 5 mil options. Order a single bag in any size so you can make a decision about what size and thickness you want your shrinkable pallet bag to be. 40" x 36" x 72" 4 Mil 60 36" x 36" up to 48" 84 lbs. 41" x 11" x 11"
52" x 48" x 60" 4 Mil 70 40"-48" x 48" up to 30" 112 lbs. 53" x 10" x 10"
40" x 36" x 72" 5 Mil 60 36" x 36" up to 48" 86 lbs. 43" x 10" x 10"
52" x 48" x 60" 5 Mil 55 40"-48" x 48" up to 30" 114 lbs. 53" x 10" x 10"
52" x 48" x 78" 5 Mil 45 40"-48" x 48" up to 48" 118 lbs. 53" x 10" x 10"
52" x 48" x 90" 5 Mil 40 40"-48" x 48" up to 72" 125 lbs. 53" x 10" x 10"
Load your pallet and then cover it from the top down with a pallet shrink bag (install the bag upside down), so the bag completely covers the load. Make a vertical pleat or two to neatly reduce any extra material. At the bottom (at the pallet), take the excess bag and cuff it around the base of the pallet. Using a shrink wrap heat gun (such as the RapidShrink RS100 Shrink Wrap Gun), apply heat to first shrink the cuff at the base of the pallet, to secure the load to the pallet. Then apply heat to the pleats to weld them, and ultimately work your way around and up the pallet shrink bag until it is evenly shrunk. Bag resin has 6 months of UV inhibitors*. All resins are 100% virgin. Shrink Bags shrink up to 20%. Recyclable #4 Low Density Polyethylene (LDPE). 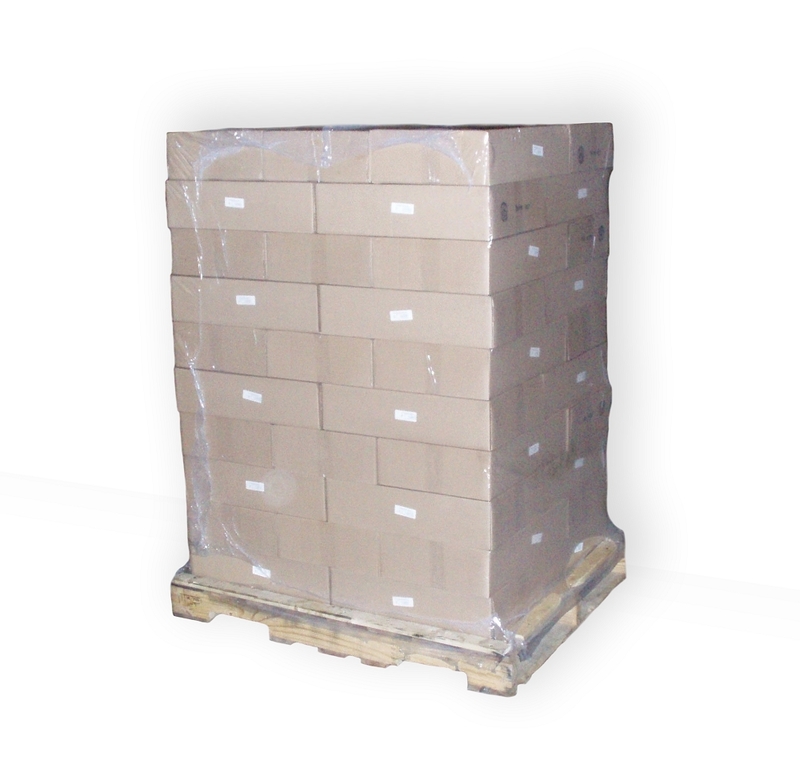 *The UV inhibitors protect the pallet shrink bags from UV damage, but do NOT protect the content of the bags. 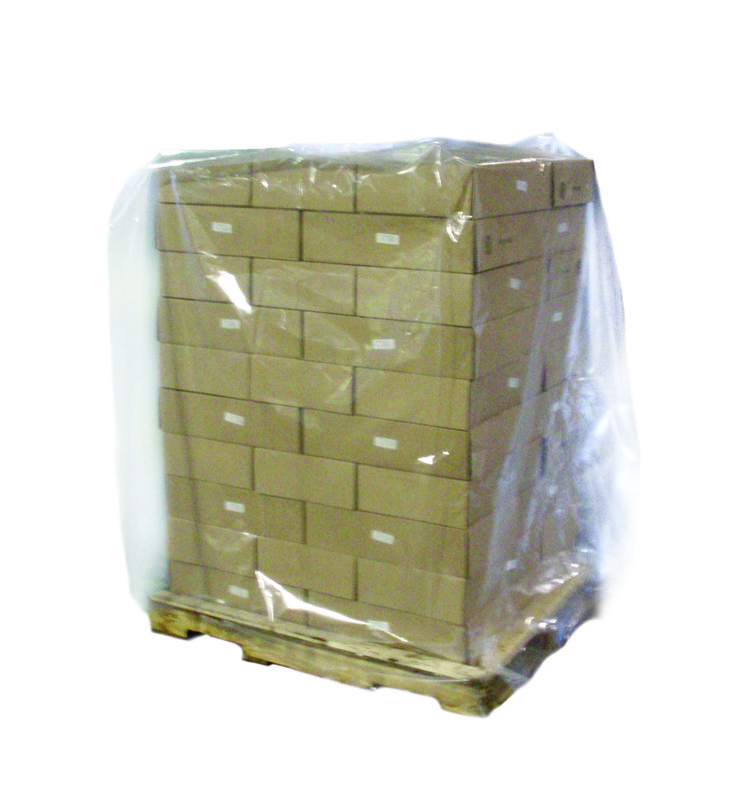 UV rays will penetrate the clear pallet shrink bags and can have a "greenhouse" effect.